Hey, it’s Tuesday, here’s a place with wine on tap. 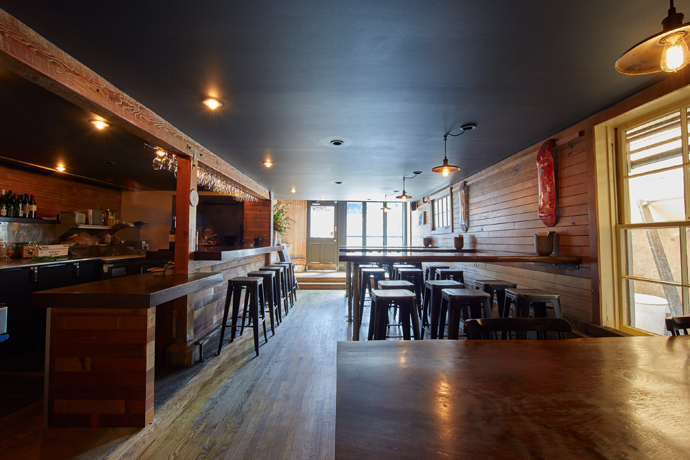 Say hello to Jamber Wine Pub, a rustic, two-story tavern where the beer and wine flow from taps and only taps, soft-opening this weekend in SoMa. Sorry. That was a little abrupt. Allow us to elaborate. First: this place is in an old elevator repair shop. Which is great in case you’ve got a broken-down Otis on your hands, and better if you just want a place with exposed steel beams and industrial chains to take a date. Second: the owners love wine. Like, really love it. They’re brother and sister, and the sister drank enough wine over the past 12 years to build f**king tables out of the corks. Related: sit at one of those tables when you’re here with that aforementioned date. Third: all the wines are from California. They’re poured into glasses repurposed from pinot grigio bottles. If you want something from down the road (literally, down 3rd Street), try Dogpatch’s Sutton Cellars vermouth. Or if you’re looking to splurge, opt for Napa’s boutique-y Jack Brooks cabernet sauvignon. They’ve got beer, too, including a Ruhstaller 1881 red ale that’s traveling over the Sacramento county line for the first time. Finally: the food. There’s deep-fried pickles, steak pot pies and meat loaf sandwiches. Chardonnay and meat loaf, together at last.